We have many opportunities for our adults to grow in their faith walk. There are number of small groups that meet at different times throughout the week. Currently, we have 4 Sunday School classes that meet from 9-10 am. These classes are open to every one. We would love to introduce you to the classes so you can find the best fit for you! If you have any further questions or want more information about any of our adult ministry opportunities, contact Lisa Wilson, by phone at 704-875-6892, ext 30 or click the button below to contact her via email. Pray, Pray and Pray some more! God loves it and the Devil hates it. E. M. Bounds offered perhaps a more profound understanding of prayer than any other contemporary Christian thinker. This classic books on the personal communication explore how prayer must come from the whole being and strengthens faith in Christian lives. FLC Room 201. Meets on the 2nd Monday of the month at 10:30 am in room 202. Our women’s ministry has 3 big events each year: a brunch in the spring, a retreat in the fall and a cookie exchange in December. You can find detailed information about upcoming events on the events calendar. Meets on the 3rd Saturday of each month for a variety of activities. Please see the events calendar for more upcoming activities. Thursday's from 6:30 pm - 7:30 pm. Bring a Bible and friend! Looking for fellowship while shootin’ hoops? 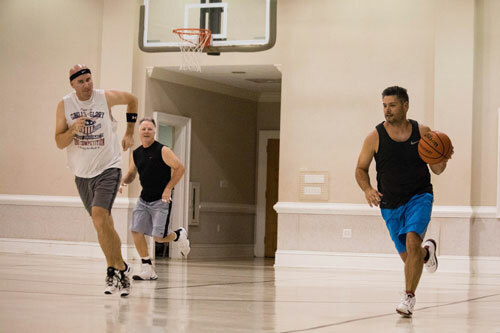 We have men’s basketball in our Family Life Center gym each Monday evening beginning at 6:30 pm.